Advanced strategies for 501 darts. The game of 501 tests your ability to consistently hit high numbers every time you step up to the line. The main thing to remember is to relax and trust your game. It also helps to memorize all of the dart sequences for your out numbers. Here are some tips that can help you improve your chances of winning. Find your hot number. Don’t ignore numbers on the board just because they aren’t the highest on the board. If you’re hot on 18s, run with them. A good general rule of thumb is to hit a total of 60 points or better per round. Four 18s will get the job done. Remember that this is a numbers game – go with what you feel comfortable with and hit a lot of them. Ignore your opponent's throws. It sounds crazy, but there is very little gained from knowing he/she just threw a ton-80 or an eight. A lot of people let this affect their game in a bad way. In 501 the dartboard is your competitor. Beat it by consistently hitting your numbers. There is one exception to this rule. If you thrive on adversity then knowing your opponent's score could pump you up to throw better. Work on slowing down your breathing. You just hit a ton-40 and everybody gives you a high-five. Your adrenaline is pumping, you feel like you can conquer the world. Then you step up the line for your next shot and you throw a bag of nails (11 shot). What happened between these two turns? You got pumped up and full of energy, that's what happened. This change in demeanor can alter your throw. Relaxed and calm is how you want to be on the line. Just take a few deep breaths between shots, forget about your last throw and visualize your darts in the triple ring. Following your aim. Sometimes you can find yourself throwing poorly because you are trying too hard to aim your darts. 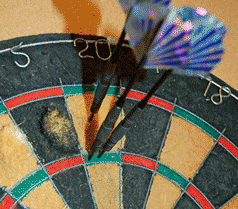 Concentrating too hard on each dart’s destination can cause you to get tense and can easily spiral out of control. You might even find yourself battling dartitis. 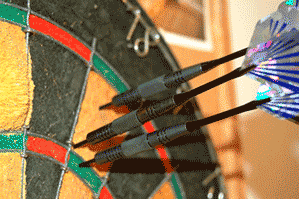 Consider focusing your aim on your first dart and then use that dart as a marker dart. 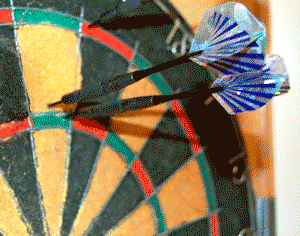 As long as that first dart is a good shot, all you have to do is repeat your throwing motion at your marker dart. 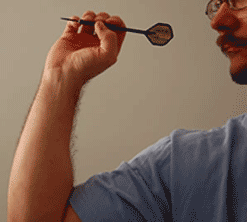 By not having to concentrate on aiming every dart you can maintain a relaxed and calm state of mind, which is the key to throwing great darts.